If you live near the Southold Town border, in Peconic or Orient, you might notice more helicopter traffic this summer. The Eastern Region Helicopter Council, a pilot advocacy group, has unveiled recommendations to distribute the volume of air traffic throughout the area — as opposed to just over Mattituck Inlet — by establishing a new passage for landings and two additional takeoff routes at East Hampton Airport. Southold Town Supervisor Scott Russell said he opposes the plan, which is a recommendation pilots wouldn’t be mandated to follow, because he believes it will only lessen complaints on the western end of town and annoy more residents on the eastern side. During the Town Board’s April 19 work session, Mr. Russell launched a campaign to have the plan rejected. He posted the council’s map of the new routes on the town’s website with a message asking residents to voice their opposition by contacting the offices of Congressman Lee Zeldin (R-Shirley), U.S. senators Charles Schumer and Kirsten Gillibrand and Federal Aviation Administration representatives. Mr. Russell also included contact information for each government official. Currently, the council’s website contains no information about the proposal. When reached for comment, an Eastern Region Helicopter Council spokesperson said in an email that the group is working with elected officials and community leaders to address helicopter noise concerns. “The proposed transition routes to and from the mandatory North Shore route have been carefully analyzed to attempt to significantly reduce noise impact for residents on the North Fork of Long Island,” the spokesperson said. 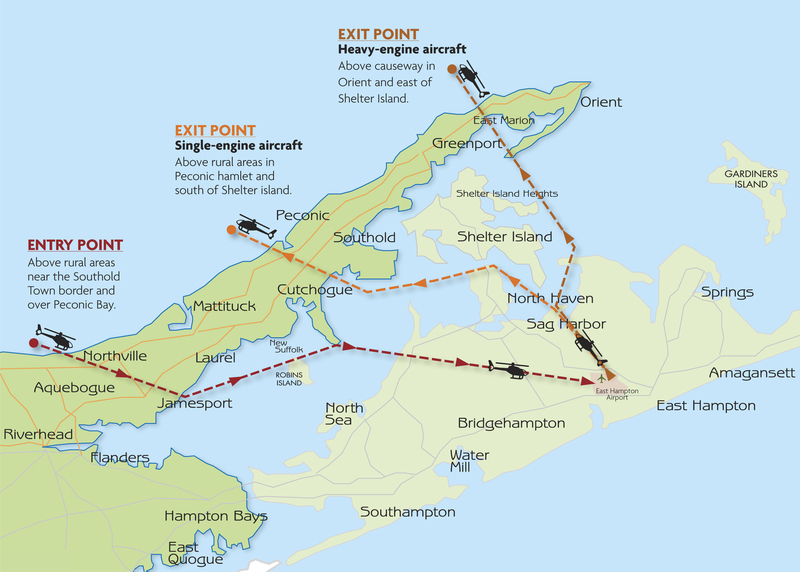 For single-engine planes exiting East Hampton Airport, the council recommends pilots use a route along the southern portion of Shelter Island and over Peconic hamlet. They also suggest that pilots flying in heavy-engine aircrafts who are taking off from the airport fly along the eastern side of Shelter Island and over the causeway in Orient. Since these locations aren’t precise, Mr. Russell said residents in the neighboring hamlets of Southold, Cutchogue and East Marion will also be affected by the new routes. As for incoming helicopters, the council is looking to do away with using Mattituck Inlet as the lone landmark pilots use to transition to the South Fork. Instead, they think pilots should fly over rural areas where the federally mandated North Shore route over the Long Island Sound ends — which Mr. Russell believes is located around Pier Avenue in Riverhead. “Anything from there is called ‘transitional,’ so there isn’t any requirement under the law to stay offshore,” the supervisor said. An FAA rule approved in 2012 and commonly referred to as the mandated “North Shore route” requires helicopters to fly over the water across Long Island Sound — one mile offshore — and to go around Orient Point rather than fly over houses. But the rule allows pilots to deviate from the route when required for safety reasons, weather conditions or to transition. Local officials have said this only makes the situation worse in Southold Town, since it allows helicopters to cut across the North Fork on their way to East Hampton as they transition south. Mr. Russell said Mr. Schumer’s office has confirmed that a proposal is on the table to extend the mandate, which expires later this year, for another two to four years. The supervisor only supports a couple options to alleviate helicopter noise: scrap the North Shore route mandate and require pilots to travel along the South Shore, or expand the mandated passage over a few miles to the eastern side of Plum Island and over Gardiners Bay. Ideally, Mr. Russell said he’d like Mr. Schumer to withdraw support for the North Shore route. Marisa Kaufman, a spokeswoman for Mr. Schumer’s office, said in a statement the senator is working with community leaders and the FAA to permanently decrease noise pollution in the area. Some members of Southold Town’s helicopter noise steering committee have different opinions about the council’s latest proposal. Not everyone has been quick to voice opposition to the council’s plan. Fellow helicopter noise steering committee member Amy Greenberg of Mattituck said that while she would prefer having pilots fly above 2,500 feet — or go around the North Fork or along the South Shore — she believes the council’s proposed routes will provide some relief to the area from helicopter noise.